The briefing provides various examples of these benefits: for example, it explains how pay as you drive motor insurance policies enable insurers to tailor insurance premiums, resulting in savings for good drivers. 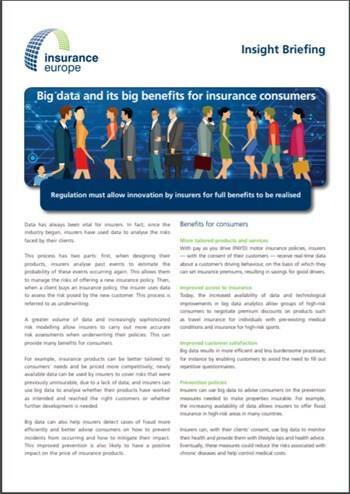 In fact, the briefing warns that premature regulation could not only hamper innovation and impair the effectiveness of the insurance market, but also quickly become unfit for purpose due to technological advances and market developments. Regulators and supervisors should instead ensure that existing rules — which already provide a framework to guarantee the responsible use of big data — are fully implemented and enforced at national level.